Bilel Mohsni is in line for a shock return to Scottish football, with Dundee United reportedly keen on signing the centre half. Former Rangers defender Mohsni’s first spell in Scotland came to a controversial end in May 2015, after the Ibrox side had lost to Motherwell in the play-offs. The 30-year-old, who has made six appearances for the Tunisian national side, kicked and punched ‘Well forward Lee Erwin after the final whistle, and was slapped with a seven-match ban for his part in the post-match fracas. He quit Scottish football that summer, but could be set for a surprise return with Tannadice boss Csaba Laszlo reportedly keen on securing his services. 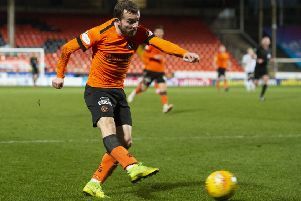 Mohsni, who trained with the Terrors on Thursday, played under newly-appointed Chief Scout Paul Sturrock at Southend, and the ex-United boss has moved quickly to recommend the free agent as a potential signing. After leaving Scotland, Mohsni had short spells with Angers and hometown side FC Paris in France, before joining ES Sahel in Tunisia. But a row over unpaid wages saw him leave Sahel, and Mohsni is now attempting to sue his former employers for around £1 million. Prior to joining Rangers, Mohsni played for lower league French sides Sainte-Geneviève Sports, CO Les Ulis, AF Lozere and US Saint-Georges, as well as Southend United and Ipswich Town in England.